When New Zealanders drink Sangria, the mix of wine, fruit, a spritzer and sometimes spirits that is hugely popular in Portugal and Spain, it is more likely to be a concoction of their own making than something you pour from a bottle. But pour it from a bottle you can, as more and more Americans (bless their little star-spangled socks) appear to be doing. In fact they're wild about the ready-made stuff according to John Casella, the boss of Yellow Tail Wines, the Australian outfit that turned its bargain bubbly with the bounding kangaroo label into America's favourite imported wine..
Now Yellow Tail is trying to do much the same with a Sangria, selling 90 per cent of the 300,000 cases made last year to the United States where it retails at around $8 a bottle. 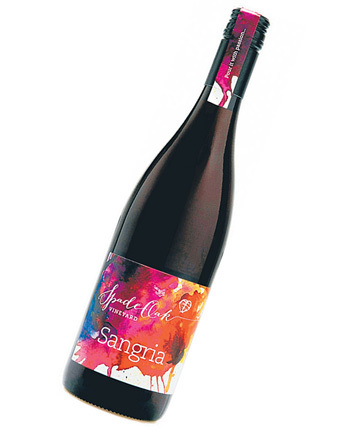 So far none, or precious little has found its way to New Zealand, where most bottled sangria, or the base for this wine fruit punch, is from the homes of port and paella. But now, and this will probably come as a surprise to many already familiar with this thirst-quenching, food-friendly summer drink, we have one of our own. And could soon have another. The first was introduced more than 12 months ago and given a trial run at Gisborne's annual wine and food festival. The reaction was encouraging enough for adventurous local winemakers Steve and Eileen Voysey of Spade Oak to add it to their growing and eclectic range of wines and to consider introducing another. The original, which can now be found in several wine shops, some restaurants and is available by mail order, is based on red wine. Truth is it was as good a way as any for the Voyseys to use their young tempranillo, the Spanish favourite, and to produce a sangria with an authentic Mediterranean taste. So they gave it a whack. Getting the mix right held no terrors for Voysey, formerly the chief winemaker for Montana in Gisborne and a dab hand at blending. The recipe, if that is what you call it, was however, a little different in this case. To get the desired taste Voysey supplemented the tempranillo with a tot of syrah, organic orange, lemon and grape juices and a measure of locally produced cider - probably from the local Sunshine brewery, in which he is a partner. The result is a drier than usual sangria (honey syrup or sugar is often used as a sweetner). It's a bit like a spritzy rose that weighs in at just 8.5 per cent alcohol and fulfills the role for which it's best known - as a great summer drink, with or without food. Just pour it over ice. None of which will endear me to the purists, the wine snobs . . . whatever you want to call them. But what the hell. This is a pleasant and widely-used drink in which the Voyseys now feel confident enough to contemplate the production of a Sangria blanco, based on white grapes, which are in some cases are also mixed with red in Spain. A fresh and floral Gisborne take on this zesty Spanish white that hints of stonefruit and citrus but rests on its florals. One of the few examples of this rich and aromatic wine being produced in New Zealand. Medium sweet and lush with white stonefruits, florals and a lick of honey in the mix. Use as aperitif or dessert wine. A member of the pinot family and the most widely planted red grape in the Czech Republic. An earthy, rustic and juicy black cherried wine that's a perfect accompaniment for hearty winter food.